Adds a new leg to the strategy. Removes selected leg(s) from the strategy. Removes all legs from the Strategy Creation pane. Moves selected leg up in order. Moves selected leg down in order. Leg: Identifies the order of leg, this field automatically populates when a leg row is added, moved, or deleted within the Strategy Creation pane. B/S: Click to set the leg as a Buy or Sell. Qty: Enter the quantity of contracts for the leg. Contract: Click the down arrow to select a leg using Instrument Explorer. Price: Enter the contract price for covered and volatility strategies. Note: This field is disabled when the combination of contracts in the Strategy Creation pane does not include at least one future or futures spread and at least one option or strategy. Delta: Enter the delta of a futures leg for covered and volatility strategies. The type of strategy being created. This list is determined by the legs selected in the Strategy Creation pane. Note: Refer to the exchange market rules for strategy types available. Select the order routing connection on which the strategy request will be routed. The drop-down list shows order routing gateways available for a given market. 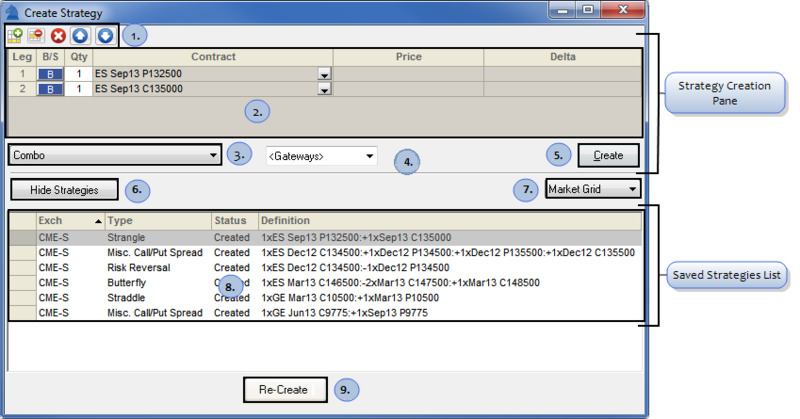 Note: In X_TRADER ASP, each connection displays the broker, gateway, and alias (MGT). Sends the strategy creation request to the exchange. Note: View the Audit Trail window for information regarding the status of the strategy creation request. Click to show the Saved Strategies list. Click to hide the Saved Strategies list. The default window that is used to display the strategy when it is launched from the Saved Strategies list. The name of the market where the strategy was created. The type of strategy (e.g., Covered or Straddle) that was created. Created: The strategy was successfully created and is available on the gateway. Failed: The strategy was rejected by the exchange or gateway. Submitted: The strategy was submitted to the gateway and is currently being evaluated. Local: The strategy has been saved on the local X_TRADER workstation, but is not on the relevant gateway and must be recreated. Note: View the Audit Trail window for additional information regarding the strategy creation request. The name of the strategy. This initially defaults to the spread type followed by the ratio and leg expirations (e.g., 1xGE Jul13 C9400:+50xGE Jul13@9980.00). Sends a strategy creation request for each selected strategy. This button is only enabled for strategies with a status of Local.